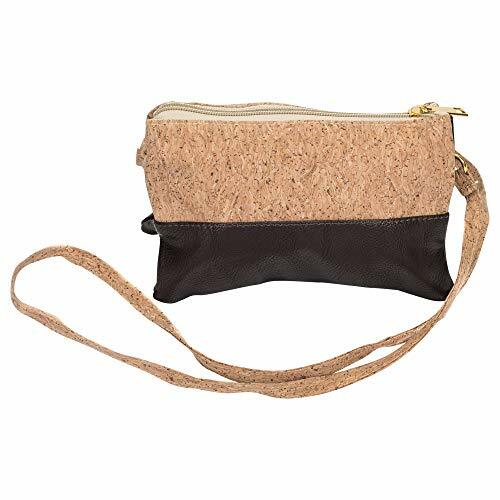 Cork and Leather Crossbody handbag features cork with dark brown leather accents. Unzip gold zipper to reveal interior change purse and two separate expandable pockets with cream polyester lining. Cork strap measures 21 inches long. Cork and Leather Crossbody handbag features cork with dark brown leather accents. Great as a gift for the fashionista in your life or simply an accessory for yourself. Unzip gold zipper to reveal interior change purse and two separate expandable pockets with cream polyester lining. Cork strap measures 21 inches long. Carefully packaged for easy gifting and storage. If you have any questions about this product by First & Main, contact us by completing and submitting the form below. If you are looking for a specif part number, please include it with your message.